The Chancellor's Advisory Committee on Staff (CACS) mission is to provide advice and feedback to senior leadership on upcoming initiatives related to staff, and to share any staff concerns and interests with senior leadership. The primary objective is to help increase staff engagement and productivity, and to mitigate current and/or potential challenges affecting staff. Members are selected carefully to bring the skills, knowledge and experience necessary to contribute to the effectiveness of this advisory group. Upon appointment to CACS, Committee members are expected to make every attempt to attend all meetings during their two year appointment, which generally tak place at least once quarterly, sometimes more frequently, during the lunch hour. 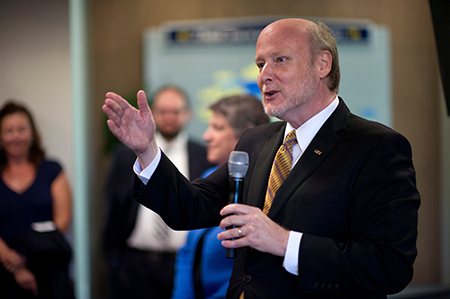 The Chancellor’s Task Force on Staff Growth, Recruitment & Retention, in its December 2001 report, recommended that a campus group be formed to track progress on initiatives recommended by the Task Force, advise on issues and actions concerning staff working conditions, and set goals for future activities aimed at recruiting and retaining top-quality staff. In April 2002, Chancellor Ralph Cicerone announced the formation of the Chancellor's Advisory Committee on the Status of Staff. In January 2014, the committee updated its name to the Chancellor's Advisory Committee on Staff. At the August 2016 UCI Staff Picnic, CACS sponsored an "Ask the Chancellor" activity, prompting event attendees to share their thoughts on items of interest to staff. We received dozens of questions that were as diverse and interesting as our staff. Questions included topics relating to campus climate, compensation, benefits, student support, and the campus strategic plan as well as invitations to the Chancellor and expressions of gratitude.